Nearly 20 years ago, Jonathan Larson’s “Rent,” a raw, updated version of the tale of “La Boheme,” burst onto the scene in New York and came to define the entire ethos of the youthful artistic fringe of the age: battling regulation, battling personal demons, fighting for truth, expression and existence in the age of AIDS. The big question, when McCoy Rigby Entertainment in La Mirada chose to revive the piece was its relevance, almost two decades later. The answer is an almost surprise yes. The story is that of the inhabitants of a former music publishing house, turned squatter’s heaven, in the East Village of New York City. They snake in electricity and scrounge for food, refuse to pay rent to a former fellow bohemian now married rich and become their landlord. They fight to preserve the homeless encampment next door. But most of all, they fight to find and celebrate their unique visions and to live into the moment. Indeed, as these young people celebrate life many also share a virus which, in their time and their income bracket, had a high likelihood of limiting their time on earth. Hence their mantra: “no day but today”. The music has become iconic in its own right. From the joyous “La Vie Boheme” to the rich “Seasons of Love,” the intense and angry “Take Me or Leave Me” and the achingly sad “Without You”. Indeed, without singers who can handle this intense and often blockbuster score, the show cannot shine. Fortunately the entire cast – ensemble included – is well up to the task. Standouts include Mark Whitten as the independent filmmaker, Mark, whose project to document a year in the life of his close-knit neighborhood becomes the foundation for the entire story. He makes Mark a mixture of joy and fatalism – just a bit goofy, with an elemental love for the people and the purpose of his part of the city. Devin Archer makes Mark’s former rock star roommate, Roger, fragile and damaged, but with a particular kind of resolute purpose. As Mimi, the heroine-addicted exotic dancer Roger falls for, Cassie Simone makes much of the pathos, the manipulativeness and the openness of a young girl trying to find her space in the world. Also impressive are John Devereaux as Tom, the professor loving the free life of the Village, and Amber Mercomes as Joanne, the young lawyer trying to balance her powerful family and the love which has swept her into bohemia. Yet the two finest performances come from its two most colorful characters. Emily Goglia gives the activist performance artist Maureen the drive and the edginess to make the show’s send-up of performance art both very funny and very serious at the same time. As the deceptively strong drag queen Angel, Lawrence Cummings delivers a personality capable of such tenderness and understanding that one experiences his loss with a touch of the visceral, echoing the characters on stage. Director Richard Israel keeps the show vital and intense, and gives each person – even those in the background – a sense of character and place. Though not usually one to compare a new production to the first one, I admit to missing one staging moment from that original version, which used the wistful “Without You” to examine the three central relationships – all in crisis – at the same time, next to each other on stage. Here the singers Roger and Mimi bring focus center stage, while the struggle of love and disease between Angel and Tom has been relegated to separateness and distance from the center, and Maureen and Joanne are not even present. This may be, to some extent, a result of Stephen Gifford’s many-leveled set design, but I still miss that sense of unity in disparity. Choreographer Dana Solimando has the ability to create organized and visually satisfying chaos, and here that works just as it should. Musical Director John Glaudini has the songs crisp and vital, with some vocal licks from a couple of the ensemble members providing exclamation points in some of the best-known moments. 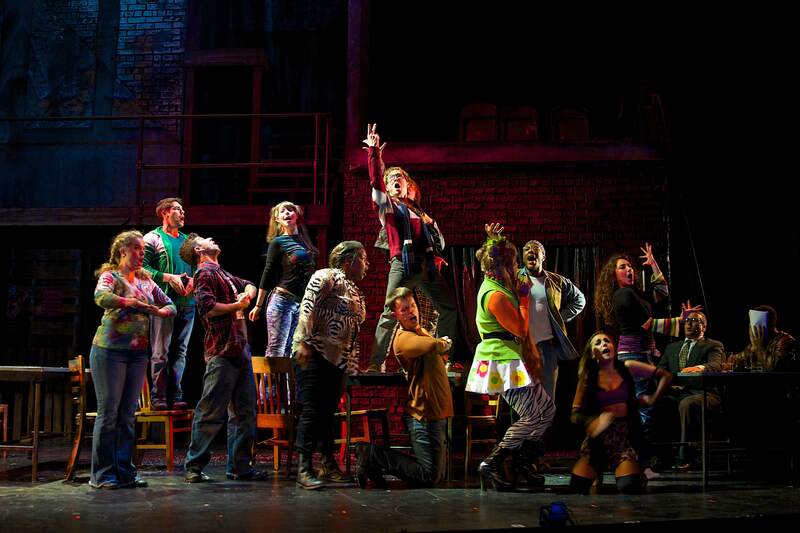 In short, “Rent” has made it to our time with a lot of the shine still on. When you consider that its statement about art and living for the moment goes right back to an opera premiered in the late 1800s, still valid when “Rent” came along about 100 years later, why would another 20 years make that much difference? The story is not about the disease which chases them. It’s not about the squalor in which they live, or the life choices they have made. It is, rather, about the sense of love and community which makes this all work. And finding community, as well as fighting for art, are themes which transcend time.